Globalization of croplands, 2004. 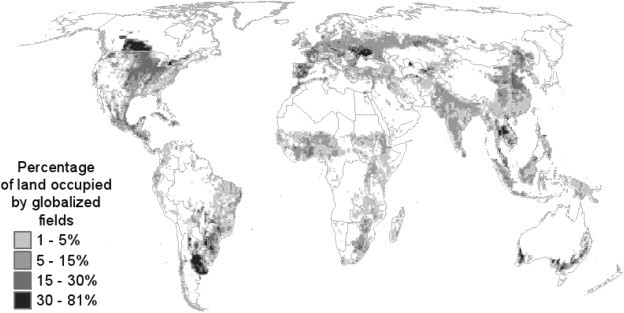 Percentage of landscape area occupied by croplands whose products are incorporated as part of commodity chains (agricultural or otherwise) whose first consumers are located internationally. Calculations by Bergmann and Holmberg (c.f. Bergmann 2013a, Bergmann 2013b). Bestselling David Quammen, who I skewered on Ebola, has a new book out on the virus. It’s an extract from his tome on spillovers I reviewed here. While Quammen pays lip service to generalized poverty as one means by which the West African strain emerged, he diligently propagates the fallacy of the culture of infection. In this ooga-booga interview he’s practically giddy with the notion proximate indigenous practices–sorcery and bushmeat–are to blame for Ebola, offering nary a word on the neoliberal policies driving deforestation and land grabbing. It isn’t a matter of ignorance on his part. If by our clash alone he knows the other arguments. For reasons deeply embedded in the political economy of ecohealth, he chooses otherwise. If not David Quammen and his ecohealth handlers, to whom he appealed in our fracas, then what? In this Social Science & Medicine article in press, my colleagues and I unpack that economy, detailing the conceptual and methodological trajectories by which the One Health approach fails to incorporate social determinants of epizootic spillover. We also propose an alternate science that, among other possibilities, quantifies the relationships among transnational circuits of capital (as exemplified in the above figure), shifts in agroecological landscapes, and the emergence of new diseases. should be able to help researchers develop a sense for whether diseases that emerge in economic/agroecological landscapes are connected to export-oriented agriculture, manufacturing, or even services. With the synergistic nature of disease emergence, more-than-local and nonlinear approaches to the empirical study of human-environment processes within One Health are increasingly feasible and fundamental to the future of the field. Wallace RG, L Bergmann, R Kock, M Gilbert, L Hogerwerf, R Wallace, and M Holmberg. The dawn of Structural One Health: A new science tracking disease emergence along circuits of capital. Social Science and Medicine. In press. This entry was posted on October 6, 2014 at 12:52 pm and is filed under Ecological resilience, Evolution, Revolution with tags David Quammen, neoliberalism, One Health, political economy, social determinants, Social Science & Medicine, Structural One Health. You can follow any responses to this entry through the RSS 2.0 feed. You can leave a response, or trackback from your own site.